Selecting a tree for your landscape is such an important undertaking that two articles are needed just to provide an overview of the subject. 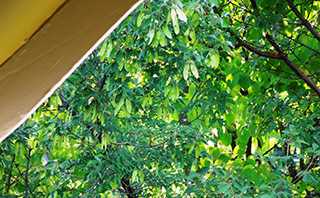 Part 1 of this article addressed the benefits trees provide, both for your landscape and for the larger world; concerns about trees; and trees for special situations, such as to beautify your landscape, create a focal point, or provide shade. Part 2 offers more reasons to incorporate trees into your landscape, including to enhance a pleasing view or to screen out an unsightly one. This article also addresses trees for challenging sites and how to select the best specimen from among the trees offered at your local nursery. 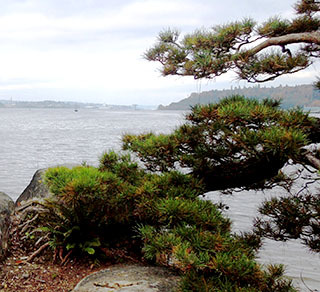 Stunning vistas abound throughout Seattle and the entire Puget Sound region. From every area we can enjoy views of water or mountains—and often both. As a consequence, landscape designers frequently hear: “We do not want any trees that will obstruct our view.” While that sentiment is understandable, views can be framed or enhanced through careful tree selection and placement. Consider our native Madrone (Arbutus menziesii), which dots the rims of bluffs throughout our region. Many homeowners go to great lengths to preserve these majestic natives, even though they might interfere with a panoramic view. They do this because the trees are beautiful and evocative—the view becomes even more breathtaking when framed by a Madrone. Nonetheless, I do not recommend planting a Madrone. Like many natives, this tree performs best where it grows naturally; and sadly, it has been plagued in recent years by several maladies that affect its health and detract from its beauty. But other trees can create an effect similar to that of the Madrone. Select a tree with beautiful bark and an open form, so that the limbs of the tree enhance rather than block the view you want to preserve. Good choices include a crape myrtle such asLagerstroemia x indica ‘Natchez’, a full-moon maple such as Acer shirawasanum ‘Aureum’, or our native shore pine (Pinus contorta var contorta), which adds a “Northwest Asian” element to a landscape. It is fairly easy to screen out an unattractive view with dense plantings, such as afforded by a tightly clipped hedge or informal plant screen. 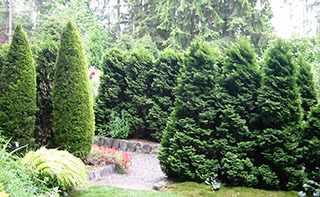 A row of narrow conifers, such as Emerald Green Arborvitae (Thuja occidentalis ‘Smaragd’), can create a lush, living fence while also making a bold architectural statement. Other trees for evergreen screens include the Chilean native Azara microphylla and Wax Myrtle (Morella californica). Both of these versatile evergreens lend themselves to heavy pruning or shearing—or even cutting to the ground to rejuvenate. Alternatively, a well-sited tree can redirect one’s attention away from a blighted area and toward a more pleasing sight. From my second-floor bedroom, I look into a lovely canopy of deciduous trees. What I don’t see are the passing school buses, parked cars, and power lines just beyond. Instead, I observe chickadees tending their fledglings and the changing landscape of the seasons. The winged seeds (samaras) dangling on the Paperbark Maple (Acer griseum) today will be followed by peach-colored leaves in November, then the peeling cinnamon bark of the leafless tree in winter. Not only is the Black Tupelo (Nyssa sylvatica) arguably the finest tree for fall color, but it also withstands wet sites and clay soil. The River Birch (Betula nigra), with its wonderful flaking bark, can tolerate similar conditions. 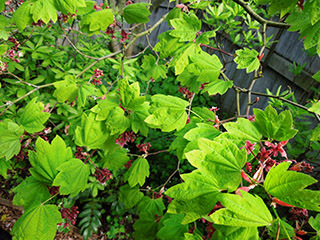 Trees that can thrive in deep shade include our native Vine Maple (Acer circinatum) and Japanese Hornbeam (Carpinus japonicum), a lovely small tree with finely corrugated leaves. If you have dry shade, try Cornelian Cherry (Cornus mas), a dogwood with yellow flowers that light up the winter landscape, then bears cherry-like fruits in fall. Flowering cherries and crabapples thrive in warm, sunny spots. Malus ‘Adirondack’ and Cutleaf Crabapple (Malus transitoria ‘Golden Raindrops’) are two exceptionally fine choices for Seattle. If your site is hot and dry, plant a Strawberry Tree (Arbutus unedo). Once established, this handsome evergreen needs no special attention. Landscape designers can provide more suggestions for trees that satisfy your objectives while also being appropriate for your site. How to Select the Perfect Tree? Once you’ve reviewed the options and have decided upon a particular tree, the next challenge is to select the best from among the choices available at your nursery. First, look at the structure of the tree. Does it have a strong form with strong, well-spaced branches? Is the trunk free of wounds or damage? Brush soil away from the base of the trunk to make sure no roots wrap around it. Girdling roots can restrict a tree’s vascular system, stunting its growth and reducing its vigor. Try lifting the tree. If it’s lighter than you feel it should be, the root system might not be well developed. If it’s heavier, perhaps the tree has been in its container too long, and it will be hard for the roots to expand out of their compressed area and into your garden soil. Truly, there is much to consider when selecting a tree. As a consumer, your task is to choose the tree that matches your aesthetic preferences, functional needs, and site conditions. Once you’ve done that, your next task is to select the best specimen from among those available. It’s a big job, but you can do it! If you decide you would like some help, landscape designers and other landscape professionals have the expertise to assist you. Then, once you’ve selected the perfect tree—whether to beautify your landscape, provide a focal point, offer shade, enhance a view, screen an unsightly one, or a combination of these objectives—the only question remaining is: What is your next tree?